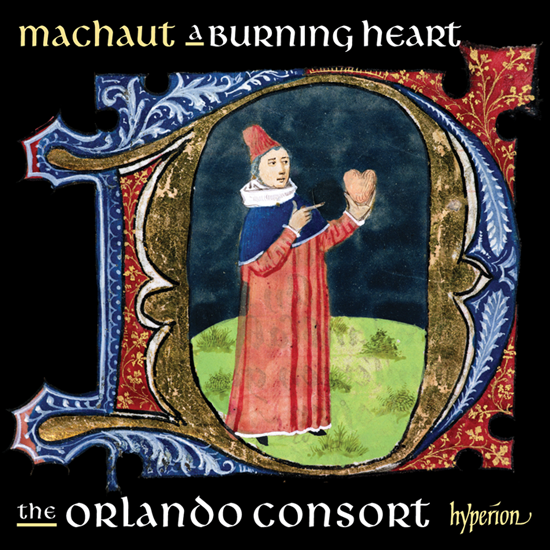 This is the third of The Orlando Consort’s recordings of Machaut’s secular songs, following on from their ‘Songs of Le Voir Dit’ and ‘The Dart of Love’ CDs. Music like this can be appreciated at many different levels, and perhaps one of the most satisfactory (unless your mediaeval French is up to scratch) is to ignore the programme notes or translations of the text, turn the lighting down and just let the music wash over and through you. Although it might appear disrespectful to the enormous amount of research that has to go into producing a recording like, it really does work as a musical experience. The other extreme will take you a lot of time, and intellectual energy, as you grapple to come to terms with what we would probably now see as the curious world of the mediaeval poet and the mysterious world of courtly love. And this is where Uri Smilansky’s excellent programme note essay comes into play. About two-thirds of it delves into the why’s and wherefore’s of courtly love and, although it will may still leave you feeling rather confused, it will at least help to explain how Machaut, an ordained Canon of the church, can write so enthusiastically about sexual desire and lust of the most extraordinary sort. Of course, Machaut was far more than just a priest. For much of his life he worked at the highest administrative levels of court life for several monarchs, including King John of Bohemia and Count of Luxemburg; Charles V, the Duke of Normandy; and Charles II of Navarre. It is also important to understand that Machaut was first and foremost a poet, his musical compositions being an extension of that art. If you are tempted to go further than letting the music alone encompass you, you will be amazed at the complexity of the poems and the musical configurations that Machaut conjures up. You can access the complete programme notes from the Hyperion website here.